Why don't people still use butter churns or laser discs or nano pets anymore? Probably because we live in a place I like to call the "now". I love churning my own homemade, cage-free, all-natural, low-fat, hypo-allergenic, earth-friendly, homogenized, gluten-free, unsalted butter but who has the time? No one that's who. Also, where do I store my butter churn in my 1 bedroom apartment in the middle of the city? It's not a very good accent piece because it smells like old butter and it is starting to attract raccoons. My lease clearly states, "No Pets". There just isn't a place, in this modern world, for butter churns, digital pets and giant laser discs yet we insist on keeping our teapots. 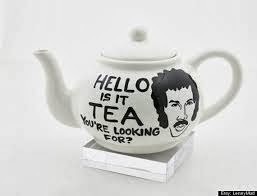 The teapot is about as antiquated as a butter churn but without all the raccoons. When I watch someone pull out a tea kettle from their bottom shelf and fill it with water and then put it on their stove top next to their microwave, I want to call up the History Channel and alert them to this ancient (possibly alien) technology. Did you not see the microwave? Do you know you are probably wasting water in that tea kettle (not earth friendly, earth unfriendly). Did you also miss the pot that was already on the stove and is a multi-tasker. Not only can a pot boil water for Ramen noodles but it can also boil water for tea...if you like Ramen flavored tea. Using a tea kettle is the equivalent of staring science in the face and saying, "F*ck you! I'm gonna go live in the woods, worship Pan the Goat God, eat raw meet, befriend these raccoons and I'm not even gonna upgrade to the iPhone 5S!!!!". I Don't Know What Is Real Anymore!